Weber has time and again proven its worth through their ground-breaking technologies and constant innovation and the Performer Deluxe Charcoal Grill is one of their flagship models which has been under the limelight for quite a good number of reasons. It comes with state-of-the-art features like Gourmet BBQ System cooking grates, Weber’s signature gas ignition system, a waterproof cart and much more. Thanks to the gas ignition system, you can light up the charcoal effortlessly and be cooking faster than you think. If you’re planning to buy this versatile and powerful charcoal grill, check out just what it has to offer. A push button ignition system for lighting the charcoal easily. Weber’s Gourmet BBQ system cooking grates with a removable center. A massive cooking surface area of 363 square inches. Two separate charcoal trays to help with indirect grilling. One-Touch cleaning technology to facilitate easy cleaning. The grilling performance is the first thing you will notice about this grill. Its Touch-N-Go gas ignition system is a remarkable feature and it uses a regular disposable propane bottle as the source of fuel. Once you insert the charcoals and push the button, just wait for 10 minutes to let the grill reach the ideal temperature for cooking. 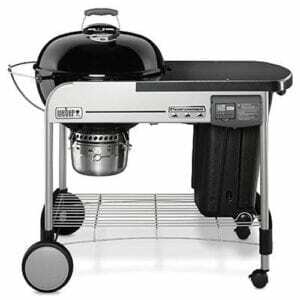 Weber products are known for their out-of-the-box design and the Perforemer Deluxe Charcoal Grill is no exception with its stylish appearance. Cleaning up the porcelain coated bowl is fuss-free, thanks to Weber’s One-Touch cleaning system. The two charcoal baskets hold the charcoal safely and allow you to place the heat where you need it. You can spread the pieces apart if you want to give the seared steaks a nice smoky flavor through indirect grilling. The top and bottom vent work together, allowing you set the right temperature and adjust it conveniently as per your requirements. To make sure you don’t accidentally burn your hand, which most of us have at some point of our lives, the nylon handle comes with a heat shield. In fact, the lid is a great feature of this grill for more than one reason. It seals tightly around the grill and produces the perfect level of heat for slow roasting or grilling your food. Assembling the parts would take you around 40-60 minutes. If you follow Weber’s assembly instructions you can’t go wrong. It has a removable LCD timer which can you can put in your pocket at take with you so that you don’t have to stay there and watch it the whole time. The grill also comes with a built-in thermometer which is great for slow cooking. The 363 Sq inches grill diameter is big enough to cook a sumptuous spread for 10-12 people in one go. It is equipped with two jumbo wheels on the rear and 2 castors on the front to make it very easy to move around on your veranda or patio. To keep the table-top mess-free, the bottom grate shelf lets you store other accessories. The propane bottle is very small and won’t last for more than 4-5 cooking sessions. Another option is to use a normal sized propane gas cylinder with hose attachment. The Weber Performer Deluxe Charcoal Grill might be an expensive grill for some, but it does have plenty of features that give you a great cooking experience every time. You will have no qualms about the grilling performance as even a novice can prepare tender, succulent kebabs and steaks without breaking much sweat. You just have to consider what kind of things you’ll be cooking the most and if you like to cook with charcoal then this grill would be a fantastic addition to any outdoor area. Push button ignition system for lighting the charcoal. Stainless steel cart with plenty of bench space. Large cooking surface area of 363 square inches. Two separate charcoal baskets to help with indirect grilling. Have to wait for charcoal to heat up before cooking. Needs assembling – Up to an hour.